As a New Yorker, I think it's in our DNA to gravitate towards all black looks. Black is a stable in my wardrobe. It's simple, chic, and timeless. An all black look is basic but doesn't have to look it. With key mixes you can take an all black look from boring to interesting. 1. Mixing Materials. Have fun with mixing materials and textures. Use pants like wax jeans, like these Vigoss jeans, or leather pants and pair it up with sueded boots. Try boots that are either knee high or over the knee. Mixing textures can give the look dimension. 2. Statement Coat. Use your coat to make your outfit pop. Pick a coat that is patterned or colorful. 3. Mixing Prints. I love using accessories to mix in prints with a look. 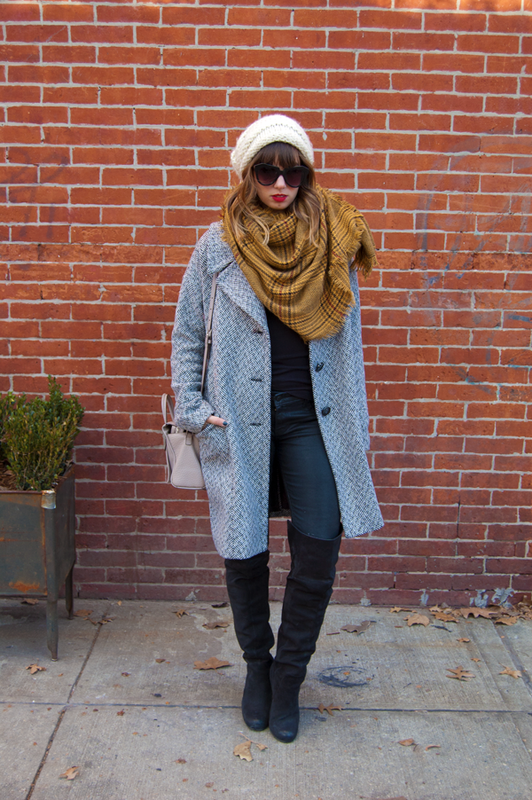 Scarves are a great way to add color and prints to this look. Especially when you can wear the scarf with just your overall look. How do you wear all black looks? I love wearing all black. Living in Ohio (boo), i find wearing black a staple that reminds me of the city i love, NYC. Some of my family lives there, so i am lucy to venture there every so often. Good idea ;) I love wearing all black look. It feels so classy. Great style tips on how to wear black more beautifully - I am also a huge black fan so these tips would certainly be helpful!! Wishing you a very Merry Christmas! !